Bedtime. One of my FAVORITE words in the English dictionary. As evening lingers, my four year old runs around on all fours like a zebra (yes, a zebra.) I wish her energy was as contagious as the hand, foot & mouth she shared with me recently. But one thing is for sure, getting tucked in is inevitable and sharing a book together before bed is something we both look forward to. I try to remember that one day this little rascal won’t fit on my lap to read stories anymore. These are precious moments. To any kid, it’s always the best day to get a gift for no reason. Before I could say, “that wrapping is adorable…,” half of it was on the floor already. Inside was a whimsical bedtime set called the Slumber Sloth. I may not have ever touched a softer stuffed animal before. This sweet sloth was just waiting to be cuddled. The book that accompanied this new friend looked just as welcoming. The watercolor illustrations drew us both in. As the evening wound down and bedtime revved up, I am astounded just how much animation is still spewing from our daughter. Putting pajamas on is like trying to lasso a mini bull. But, she manages to sit down for a sweet moment with her little sister to “read” from her new book. I love hardcover books like these. I don’t mind if my 7 month old’s little hands (and mouth) meet it. The Slumber Sloth book will have to compete with the other grand collection of books already on her bed. I mean it has stiff competition, Dr. Suess, the Bernstein Bears, and just a few hundred more. This girl does looooooove books. But it seems this book has moved up the ranks already. 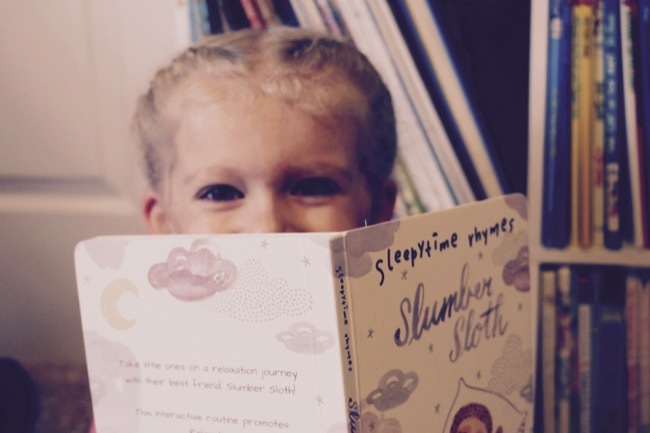 There’s something about being able to snuggle the same sweet sloth that’s in her new book. Our bedtime ritual is very consistent and predictable. We give the 5-minute heads up, we get pajamas on, we brush, we read. Despite the endless vigor, I believe she thrives on knowing how every night unfolds. Sharing a book together is the final piece before lights out, but she’s not always even remotely calm yet. This book was going to be a good test to see if it could indeed engage a sleepiness within her. “Now it’s time to calm your mind. 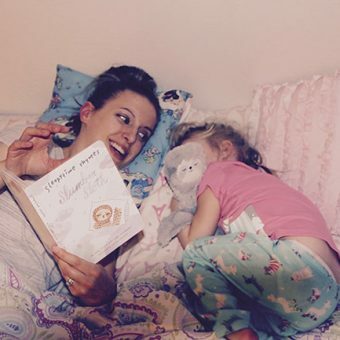 Relax your head and heart before bedtime.” The sleepy time rhymes have a soothing rhythm to it. Next came a sequence of calming steps. “Now it’s time to shut your body down. Starting at your feet then up to your crown.” The story continues to place focus on each part of your body to relax. It was engaging to her to point to where her crown, and shoulders and hands were. This seemed to begin a mildly induction into la la land. To think about relaxing each part of her body planted the seeds of sleep. Another big plus, this is not one of those never-ending, loooong storybooks. I love the length and simplicity of it.